In 1978, East Ridge High School student Salvatore 'SoccerSam' Fantauzzo rented a small storefront at 1985 East Main Street in Rochester NY. At the age of seventeen, Soccer Sam already had years of experience in the food business. In 1972, Sam's dad had a massive heart attack. Time for Sam to go to work and help out the family. His uncle (Pizano) Fred Mione had just opened the new Fred's meat market at 1978 East Main St. Sam, at the age of twelve, soon went from stock boy to cashier to meat-cutter to weekend manager. Fred's made the best sub sandwich in the area, with fresh bread, fresh cold-cuts and Hellman's mayo, of course. In the summer of 1976, Fred took his family to Italy for six weeks. Sixteen year-old Soccer Sam was toally in charge of the very busy and successful meat market on the east side of town. Sam soon learned bookkeeping, time management skills and found room in the soda stock room for the future pizza/sub department. Sam would work his 12 hour shifts at Fred's 7 days a week and then go to his friend's pizzeria, Cilino's Pizza. Sam would hang out at Cilino's Pizza on Clifford Ave. in Rochester and help his good friends Nino (aka Tony) and Vince Cilino. The Cilino family was one of the first pizza families in Rochester. Sam soon mastered the art of pizza at night and during the day at Fred's he would volunteer to deliver Fred's famous sausage to all the popular area restaurants and bars. Sam would study their operations and ask a lot of questions on deliveries. Sam would take notes in his little black book. At the end of summer 1976, Fred and his wife Joan and their daughters Kathy, Jane and Michelle all returned from their family vacation in Italy. Sam was rewarded for doing a great job in Fred's 6-week absence. Sam continued on his mission to convince Uncle Fred to sell pizza at the meat market. The remodeling of the back stock room had begun. Sam began pricing ovens, mixers, etc. and started testing recipes and asking suppliers about the best products to use, the best equipment as well. Months of planning and study about the industry, but ultimately, Fred decided the pizza business was a "no go." Fred realized that his 9:00 am to 9:00 pm meat market would have to stay open until 11:00 pm or midnight. After years of sacrifice, it wouldn't be fair to his family. No pizza department at Fred's for now! In September 1977, Sam began his senior year at East Ridge High School. He took as many business related courses available and in their last semester Sam and some friends took Home Economics. Sam convinced his teacher, Ms. Adele Pacquette, to let his group do a report on the pizza business. Sam's group called and visited several pizzerias and reported on how to make products and what products to use and where to purchase them. His group soon received rave reviews on the pizza they made for the class and a great grade to go with them! Soon after the holidays in 1978, Sam was pulling out of work at Fred's and noticed a "For Rent" sign across the street at the old East Main Shoe Store. Sam couldn't sleep that night, the next day he took one of many 'personal' days off from school and met with the landlord at 1978 East Main Street. Betty Schafer was a very nice lady and her family owned the building for years. Sam and Betty negotiated for 5 minutes; "$200.00 per month, 6 months free, and do whatever you want!!" Sam kept this information from his parents and Fred for weeks. The next day, Sam called Vince Cilino from Cilino's Pizza for help. Vince took Sam downtown to meet a lawyer and register the company. Joe Guadagnino (seated in photo) was the lawyer and Sam knew his son Joe Jr. from High School. The man that guided 17 year old SS and never charged him for his services or advice. Sam wanted to register Sam's Pizza or Sammy's but both names were taken. Mr. Guadagnino suggested Salvatore's. Sam's first reaction was "I don't even know how to spell it!" Then, Sam remembered a great Italian restaurant in Buffalo, NY where his family went to on Mother's Day, Salvatore's. A real high-end, classy place. That's how Sam envisioned his pizzeria. Salvatore's Pizza and Subs was born. Vince Cilino then took Sam around town looking for used restaurant equipment and they were able to buy all the used equipment on a budget of $2,000. Oven, mixer, pizza unit, sandwich unit, and a slicer. That was it! The old shoe store was beat. No ceilings, no floors, and all the walls were cracked. Sam was great at testing and eating the food but had no idea how to remodel the site. Uncle Sam Arbore, a "tile man" by trade came in big and volunteered his time, knowledge and tools every night. Sam's good friends Phil Coraggioso, Vincenzo Vella, Gary DiGabriele and cousin, Giacomo LoRe all kicked in to help. Sam's dad was very upset that his first-born son and first generation born in the USA was not going to college. But even 'Big Sil' showed up every night to help with the remodeling. Founder Salvatore "SoccerSam" Fantauzzo working on the original East Main St. Salvatore's ventilation system. Several companies like DeGeorge Ceilings, Aberts Hardware, and Monroe Sales Register all gave Sam terms of "Pay me after you open for business, kid" and that was greatly appreciated. Sam found this real ugly fake brick paneling to cover the cracked walls, Aberts Hardware donated the paint: Pea Yellow and Puke Green that someone didn't pick up. The place was ready. May 1978 and the first Salvatore's Pizza & Subs location was ready to open. Sam's parents wanted him to finish school, and his 40 hour-per-week job at Fred's helped him to pay for the miscellaneous expenses of opening. The goal was to open by June 15, 1978. Some minor but major delays: no natural gas in the building and the oven that Sam and Vince found was gas. Sam soon learned an expensive lesson: running electric pizza ovens. On July 5th, 1978, finally, Salvatore's Pizza & Subs opens. All of the firemen of Engine 12 next door had gained 20 lbs. each that summer. They helped test and perfect all the recipes with Sam's family and friends. They also donated Sam's first-ever business cards and menus. Sam's original logo was designed by fellow Fred's employee Al Grimaldo. Sam's first group of employees were his family and friends including his girlfriend Linda Calabrese, her sister Diana, Sam's thirteen year-old brother Chuck and Chuck's best friend John Coraggioso. John's brother Phil, Vincenzo Vella, his little cousin Lisa Arbore and nine year-old sister Val answered the phones. Aunt Mary Arbore, Grandma Oliveri, Aunt Mary Sampognaro, and Sam's mom volunteered to make the dough and sauce every day. And Aunt Josephine DeLuca would help out. In 1978, the few pizzerias on the east side of Rochester did not deliver. Salvatore's was the first pizzeria on the east side of Rochester to deliver. A painted blue Monza with the Salvatore's name and phone number was Sam's every day car. Sam was one of the few employees old enough to drive so he usually was the main driver that first year! Lots of speeding tickets. In 1983 while driving his brand new Chevy Chevette all painted up with Salvatore's all over it, Sam's former girlfriend Linda (now his wife) tells him that they are pregnant! Sam looses control of the car, hitting dozens of innocent mailboxes on Helendale Rd. in his excitement to get home to tell his parents the news. December is the due date. The first child came almost five years into business when Salvatore Fantauzzo II was born on December 11, 1983. That was the day Sam gave up his part-time job as a pro-wrestler (Dr. Love) and devoted all his efforts into Salvatore's Pizza & Subs. March 1984 was the first ever National Pizza Show. It was in Orlando, FL and hundreds of new companies were there representing their products. Sam and his good friend and adviser Nino (Tony) Cilino attended, they tested hundreds of new products and toppings never before introduced in the Rochester market. From Pizza Fingers to Mozzarella Sticks, Desserts, Car Signs etc. Nino constantly encouraged Sam to open more locations and grow in the Rochester market. By the end of March 1984, Sam had introduced Salvatore's Famous Full Menu Delivery (tm) to the Rochester NY area, the first in the country. Thirty years later, those exact products that Sam and Nino found at that Pizza Convention in Florida are still on our AMAZING menu today! In 1978 a seventeen year old Eastridge High School student, Salvatore "SoccerSam" Fantauzzo took home economics his senior year for extra credit. The class project was to own a food business. Sam took on pizza as his assignment and soon realized this was his dream. After graduation he rented an empty store front across the street from his uncle's meat market located at 1978 East Main Street. Family and friends brought all their talents to help open the first Salvatore's in July of 1978 with a $5,000.00 Budget. Sam's younger brother Chuck, cousin John Coraggioso and cousin Lisa Arbore were the first hired employees. They all were under the age of 14. Sister Valerie, future Sister-In-Law Diana, future Brother-In-Law Nino Cilino, Aunt Mary and Uncle Sam Arbore, Aunt Mary Sampognaro, Grandma Oliveri, Sam's parents, future wife Linda and several other family and friends including Phil Coraggioso, Enzo Vella and Gary DiGabriele helped Sam open the first Salvatore's location. The guys at Engine 12 Fire Department, next door, were the official taste testers! John started off making boxes, moved on to baking pizzas and in no time was running the kitchen at Main Street. John and fourteen year old Chuck Fantauzzo became a great team, John in the kitchen and Chuck up front with his great personality. Five years later, John and Chuck graduated from High School and wanted to open up their own location. Salvatore's #2 was born in the kitchen of a bar called Chadwicks. Within months they outgrew this kitchen and moved to a much larger location in the Ridge/Clinton Plaza. Jack Grover, Sam's landlord at the original Main Street location, opened store #3 at 4000 Lake Ave. A few years later Hassan Alsafadi, with his brother Sam, bought this location. Hassan had worked at the original Salvatore's for years. Hassan and his brother Sam eventually purchased the building at 4000 Lake Ave, that was owned by SoccerSam's late great uncle Sam Arbore. The original East Rochester location was opened in 1986. Longtime Salvatore's manager, Marco Palazzo, managed this test pizza and wing location. Cousin Mike DelGaizo joined this location in 1988. The village of East Rochester decided to expand the road at the corner of Linden Ave and Washington Street and the building was eventually demolished. David Sykut, who was the manager at the East Main Street location for years, opened the Webster location at 2022 Empire Boulevard in a converted garage. Tony Cilino helped Dave open this location. In 1998, Tony Mangione purchased this location and moved it to its current location at 1217 Bay Rd with a pick up window. In 2010, it later became Salvatore's Pizzeria & Pub. Greg Dillingham, who joined the Salvatore Pizza Family years ago, brought his pizza delivery experience to our company. Greg eventually purchased the Monroe Ave location from Tony Cilino with the help of his wife Stephanie. Years later, they moved this location to the Clover Lanes Plaza at 2752 Monroe Ave. The Salvatore's annual staff Christmas party is hosted by Greg and his staff. The Monroe Ave location remained open until 2017, when the parcel of land including Clover Lanes & the famous Mario's Restaurant was sold to make way for a Whole Foods market and plaza. SoccerSam started Salvatore's Set Up-N-Go Catering in 1988. Cousin John, Cousin Lisa Arbore, Aunt Anna Oliveri, Sam's Dad Silvestro and wife Linda helped launch this division. Today, John at Main Street handles the Eastside Catering and Cousin Mike and Lisa handle the Westside catering jobs. Cindy (then Wallace) Kaehler was hired in 1989 to handle the accounting department. She had just graduated from Bryant and Stratton and brought her skills to the Salvatore's pizza family. Today Cindy manages the accounting division at Salvatore's. In August of 1988 SoccerSam brought pre-made Sheet Pizza samples to Susan Billow the cafeteria buyer at the Webster NY schools. Days later Susan introduced SoccerSam to dozens of key cafeteria directors in the area. He quickly converted the 6' high basement at the original East Main Street location to a school pizza factory. Several friends and family members helped make & deliver these ready to bake pizzas to most of the schools & colleges in the Monroe county area. Chuck Giglio, Helen Barbas, cousin Venera LoRe, Mary Sampognaro and others helped him grow this division. In the summer of 2000 they moved the School Division to 537 Dewey Ave and tripled the space. Patsy Fragnito converted this donut distribution bakery for us. Sam's wife Linda ran the production room, cousin Venera ran the sheet dough production room. Tom Frost joined Cindy in the offices, future brother in laws Tony Cilino & Dario Raffi ran the warehouse and several key drivers like Alex Raffi, Dave Debole, Scott Cropsy, Peter Macahimer, John Catalano and others helped this division grow. After 12 years of 4am wake up alarms Sam & Linda sold this division to US Foods in 2000. At the age of 24, John Coraggioso sold 50% of the Ridge/Clinton Salvatore's location to his partner Chuck Fantauzzo and purchased the original location at 1985 East Main Street. SoccerSam's focus became new locations, the commissary and wholesale division, the school division and catering. John totally renovated this location and continues to be one of the busiest pizzerias in New York state. Nick Semeraro, who started making boxes at the age of 9, was the general manager of this location. Cousin Mike DelGaizo, who married cousin Lisa Arbore, our first female employee, purchased the 537 Dewey Ave location. Mike had joined the company in 1988. He worked part time at the original Salvatore's and then helped open the original East Rochester location. Mike and Lisa helped perfect several recipes and eventually, in 2001, moved this location to the much bigger 1324 Dewey Ave location. SoccerSam introduced the $5 Pizza Campaign that changed our company. Locations couldn't keep up with the demand of business and were forced to increase kitchen sizes and double their employee base. Several pizzeria's in town weren't happy with this aggressive campaign and Sam hired his newspaper carrier to start his car every morning. Seriously, this campaign changed the industry for many years and several pizzeria's closed during that era. Over the years several imitators attempted this promotion without much luck. Cousins John and Mike helped test new computers to all the locations, the first pizza chain in Monroe County to do so. They also helped test Sam's new Sicilian pizza dough recipe and fresh baked Italian sub bread. Locations updated their ovens to our new state of the art Air Deck Pizza Ovens to handle the volume of the famous $5 pizza promotion. The 234-5555 hotline was developed so customers only had to remember one number and then were transferred to their favorite Salvatore's. 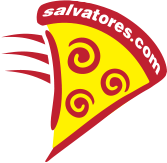 Salvatore's opened pizza outlets inside The Company Store in Gananda, NY and The Company Store in Cheshire, NY. Salvatore's sold pizza slices at several convenient stores around Monroe County. They also introduced Salvatore's soda pop and distributed three flavors throughout Monroe County (Mola Cola, Orange Sun & Purple Lips). The Coke a Cola company forced us to stop selling this product and Salvatore's switched to Pepsi. Tony Mangione, John Coraggioso's cousin from Italy, opened the Scottsville location at 1735 Scottsville Rd in 1994. One of Tony's 16 year old employees Nick Pearl convinced his parents, Chris and Clay Pearl to purchase this location in 1997. Tony wanted a location closer to his family in Webster, NY. In 2003, during our 25th year celebration, Nick Pearl was away serving our country at Camp Lagoon. The Pearls continued to operate this location today and have served generations of RIT students. With the help of High School friend and long time car dealer, Tony Gabriele, Salvatore's became the first pizzeria in town to mass market on TV, radio & print. Salvatore's hired Jade Advertising and the Decker sisters, Patty and Penny, to handle the Salvatore's marketing budget. Patty Powers handled all Salvatore's marketing and we have become Rochester's top pizzeria. Also in 1996, Sam reserved the domain name, salvatores.com. Our amazing webmaster, Michael Moran of Spinning Webs Internet & PC Services is brought on board to design and host our very first world wide website! With 8 locations, the company celebrated their 20th year in business at the Brasserie. They were the highest volume local pizza chain in the Rochester, NY area. Salvatore's was the first local pizzeria marketing on TV & radio. In 1999, SoccerSam opened America's first Soccer themed Italian restaurant. The menu included all of Salvatore's favorite items in a new restaurant concept. This restaurant received world recognition during the 2002 World Cup. The restaurant was open almost 24 hours a day during this tournament. Sam sold the restaurant in late 2002 to focus on Salvatore's and help the Rochester Rhinos Pro Soccer Team. Salvatore's celebrated their 25th year in business with the help of cousin Ray LoRe, sister Rita, Chris, Nick and Clay Pearl, Greg and Stephanie Dillingham, cousin John Coraggioso and wife Dorothy, with sister Enza Sanfiluppo, Nick Semeraro, brother Chuck Fantauzzo, cousins Mike and Lisa DelGaizo and cousin Tony Mangione, the Alsafadi family, Michael Steger, Tony "Nino" Cilino, Cindy Wallace, Patty Powers and close to 250 employees. Our Mt. Read Blvd location opened in December of 2003. Cousin Mike DelGaizo, with his long time employee, Vincent Valerie opened this location. Vinny had been with the company for over 14 years. He started making boxes at our Dewey location when he was 12 years old. Vinny and the Valerie family now operate the Mt. Read location. Sam and Linda Fantauzzo found the perfect location, and with the help of John Coraggioso, they converted this old apartment into Salvatore's Old Fashioned Pizzeria. Children, Roxanna, Silvio and Salvatore II helped open this location and eventually sold it to long time Pepsi delivery guy Carl Horsford. Carl and his family continue to operate this location today. Salvatore's Old Fashioned Pizzeria would be the new name, replacing Salvatore's Pizza & Subs and Salvatore's America's Premier Pizza. Our Ontario, Route 104 location, was originally opened by Doug Lockhart, the head chef at the famous SoccerSam's Pizza and Pasta Cafe. Doug eventually sold this location in 2005 to 18 year old Silvio Fantauzzo, who had just graduated from Webster Schroeder High School. Silvio had been helping his dad since he was ten years old. This location was originally managed by Jay Harrison, who has been with the company for over 10 years. It is currently owned & operated by Sam's son Silvio Fantauzzo. Nick Pearl, who had been with the company since he was 16 years old, opened the Henrietta location inside the Rochester Sports Garden, with the help of his parents Chris and Clay. This location recently expanded and is still located at the Rochester Sports Garden. This location delivers to the Henrietta area. John Coraggioso and Silvio Fantauzzo opened the Fairport location. This location was originally Arrivederci's Pizza and Subs, owned by Sebastian Curatolo. Sebastian was a High School friend of Sam's and trained at the original Salvatore's before going on his own. 25 years later, Sebastian retired and sold this Fairport landmark to the Salvatore family. John and Silvio totally renovated the interior of this location and Sebastian, who continued to own the property, totally renovated the exterior of this location. Today, it is one of the most beautiful buildings in the historic village of Fairport. The Fairport location is currently owned by Mike Perrotta. John Coraggioso, with the help of Salvatore's founder Sam Fantauzzo, transformed an empty store front, in the village of Victor, to Salvatore's first "new look" dine in family Pizzeria. John and Sam spent months on this location with the help of their friend and landlord Luis Ribeiro. Luis and Dom Vieira own the east side Dunkin Donuts locations. Today this location is owned and operated by Mike Perrotta, long time Monroe Ave. manager and features a selection of beer & wine for dine-in customers of legal age. Cousin Mike DelGaizo and Vinny Valerie opened this location in June of 2007. This location was originally owned by cousin Ray LoRe and his family. Cousin Giacomo LoRe helped convert this building into a Pizzeria many years ago as he did the original Salvatore's. Mike and Lisa DelGaizo owned this location for years. In 2017 Greg Dillingham the owner of our original Monroe Avenue location purchased the location. Cousin Ray LoRe spent years dreaming about putting his second location at this corner, home of the original Donut Box. Ray went to school up the street at Eastridge High School and frequently went to the Donut Box. Ray has been operating the Ridge/Clinton location for years and needed to increase his presents in the East Irondequoit area. This location soon became one of our busiest locations. In 2014, the Eastridge location would become our first location to feature the Arthur Treacher's Fish & Chips line of products. The location is currently owned by Ray LoRe and features a selection of beer & wine for dine-in customers of legal age. Sam Alsafadi had been working with his brother Hassan for over 15 years at the Lake Ave location. Sam was ready to go on his own and capture the west side market. Salvatore's had decided years ago to not go to the west side of Rochester because of several family friends owned Pizzerias and Deli's in that area. By 2008, all have closed down and it was time to explore the west side of Rochester and Sam Alsafadi took the challenge. The Greece location is doing amazing business! John Coraggioso and Silvio Fantauzzo opened this location. Cousin Giacomo LoRe did all of the remodeling and converted this long time pizzeria into a new look Salvatore's Old Fashioned Pizzeria. Granite table tops and big screen TVs were part of the new look. The plaza recently was recently renovated and Salvatore's is an anchor tenant. Craig Houghton purchased this location in 2013. In May of 2009, Doug Miller, Sam's long time soccer friend and the greatest Pro Soccer Player to ever play for the Rochester Rhinos joined the Salvatore's pizza family. Salvatore's Pizza and Wing Outlet replaced the snack shop inside the Doug Miller Sports Dome in Spencerport. This was our test location for the Salvatore's Pizza Now! vending machine in 2015. This location continues to be a pizza wing outlet. In March of 2009, The Salvatore Pizza family purchased this location. Sam had been driving by this historic landmark for the past 5 years that it was closed. He called on realtor Paul Schillaro over a dozen times with ridiculous offers on this Rochester landmark. Finally, Paul agreed to present Sam's offer to the Malley family and the deal was struck. John Coraggioso and the Main Street Salvatore's and cousin Ray LoRe, at the Eastridge Road Salvatore's owned the area rights and became partners with SoccerSam on this landmark donut shop, now serving Salvatore's famous full menu. This location took over 12 months to renovate and finally opened in January 12th, 2010. The Malley family helped with the original donut recipes. Nick Semeraro is the owner/operator of Salvatore's at the historic Donuts Delite building. In mid July of 2009, John Coraggioso temporarily took over the day-to-day office operations (SoccerSam illness) and accounting department of Salvatore's with the help of long time employee Cindy Kaehler. Brenda Sachs joined the team with years of experience in the food industry. Patty Powers joined the company full time and handled the marketing division with Lyndsay Houghton & Michael Moran. SoccerSam soon returned to operate the company with the help of wife Linda and children Roxanna, Salvatore II and Silvio and their amazing staff. November 23, 2009, tragedy strikes the Salvatore Pizza family. The Ridge/Clinton location, that has been in operation since 1984, was destroyed in an arson fire. The pizzeria was in the same plaza as the Dollar General. The Dollar General was set on fire by an arsonist and the entire plaza was destroyed. Cousin Ray LoRe was determined to re-open as soon as possible and make sure his employees had a job for the holidays. The entire company helped Ray relocate at the Garage Door Bar around the corner and today this location continues to be a success as a Salvatore's Pizzeria and Pub. Chuck Fantauzzo manages the Pub. In December of 2009, Mike Perrotta, who had managed Greg Dillingham's Monroe Ave location for over 10 years opened in the beautiful village of Honeoye Falls. Mike totally renovated this former Attorney's office and brought back all the historic character of this building with tin ceilings and old fashioned architecture. Mike's father George and brother Mark helped Mike with all the renovations. Mike & long time friend Jon Gehrke helped open this location as they did the Victor location. Mike Perrotta is the current owner operator. Tony Mangione converted the Bay Road Salvatore's to a Pizza and Pub location. With the success of the Garage Door, and the recent move of Earthtones Coffee House, Tony decided to take the space and convert it to a full service Pizzeria and Pub. Tony's son Giovanni did all the renovations and this location was the first in the company to have an outside patio and live music. The East Main Street location also added an outdoor patio and renovated the exterior of our original Salvatore's. Silvio Fantauzzo, the original owner of our Ontario, Fairport and Penfield locations, opened the Webster Village location in July 2011. With the help of John Coraggioso, his partner at Fairport and several family and friends, they converted the former Guidas/Roccos into a Salvatore's within 24 hours. This location is now a Pizza & Pub location with Beer, Wine & Full Bar. Silvio continues to operate both the Webster Village and the Ontario locations. In 2017 Silvio was promoted to President of Fantauzzo Family Brands Inc. to help grow the Salvatore brand. On July 5, 2012, the 34th year anniversary of the opening of our original Salvatore's in 1978, Hassan Alsafadi and his family opened his 3rd location at 2044 Latta Road at the corner of Island Cottage inside the Mobil station. Hassan, his wife Rudiana and brother Sam spent weeks converting this former pizzeria into a beautiful Salvatore's take-out location. Our store #10 Ontario, located on Route 104, has moved across the street to the Mike's Ice Cream building. Silvio Fantauzzo has remodeled this location with dining room seating & giant TVs and will soon feature beer and wine. This location has plenty of parking and has easier access than former location. Jay Harrison, 10 year plus manager has opened the Newark location with landlords Chris and Toni Avery on November 5, 2012. Our biggest grand opening week ever! This location has a beautiful dining room with giant TVs and also offers beer and wine. Vincent Valerie opened his second location in Spencerport, in late June, 2012. The village of Spencerport residents have been extremely supportive of this beautiful new location. Spencerport has a beautiful dining room, giant TVs and now offers an Arthur Treacher's outlet and beer & wine for dine-in customers This location is now owned by Steve Stokes and Louis Fernadez. Mike Perrotta opened his 3rd location in Avon, NY. This location opened in early December, 2012. Mike, who also owns Victor and Honeoye Falls, sold the Avon location to longtime friend & co-manager Jon Gehrke in 2016. Salvatore's celebrated their 35th anniversary on July 5th! Donna Jo Waasdorp handled new Franchise agreements. Rochester Lancers executives Rich Randall and Kayla Klark Kent helped the Salvatore's Dream Team! Our dream team expanded to include Ashley Maria King who started in May 2013 in the corporate office. Also, cousin Chucky Arbore returned to the company in August 2013 as Director of Operations. Unfortunately, a fire on July 15, 2013 caused the Eastridge location to close for several months. On the brighter side, the closure enabled owner Ray Lo Re to make many improvement to the building including updating the outdoor signage and expanding the parking lot. Many interior improvements were done as well, and the location re-opened on September 23, 2013. In November 2013, Salvatore's signed agreements with the primary sports venues in Rochester to become their exclusive pizza provider. Having our pizza available at the Blue Cross Arena makes us the "official" pizza of the Rochester Americans (hockey), Rochester Knighthawks (indoor lacrosse), Rochester Lancers (indoor soccer), Rochester Razorsharks (basketball) and Rochester Red Wings (baseball). Salvatore's also became the exclusive pizza for Red Osier all over Rochester in the Total Sports Experience in Gates, NY. Our first location to open in 2014 was the Village of Brockport at 39 N. Main St. It opened January 2, 2014 by Massimo & Sophia LoGuidice. This newly remodeled location features beer and wine, giant TVs and a dining room. Steve Stokes and Louie Fernandez purchased this location in 2016. FREE PIZZA on Your Birthday! Salvatore's introduces "FREE PIZZA" birthday promotion to their Pizza Perks Program. Anyone who is a Pizza Perks member receives a FREE medium 1 topping pizza on their birthday. Bombar Nuts - "Heat You Can Handle!" Local phenomenon Bombar Nuts were into the Salvatore's menu and is available at all locations! Bombar Nuts are infamous for their funny commercials. In February 2014, Salvatore's signed agreements with CMAC in Victor, NY and Sahlen's Stadium in Rochester to become their exclusive pizza provider. They will have pizza available during all events at CMAC and Sahlen's Stadium. On February 2, 2014 Salvatore's had the busiest sales day in 35 years with record sales across the board! Valentine's Day - "Give Him or Her a Slice of Your Heart!" Salvatore's re-introduced heart slices for Valentine's Day weekend. It turned into the busiest Valentine's Day sales ever! Local phenomenon Daniela Albano performs several exclusive renditions of jingles that aired during popular reality television singing competitions like American Idol and the Voice during their 2014 seasons. The Salvatore's Pizza Family reintroduced Rochester's favorite fish & chips, Arthur Treacher's. The first Arthur Treacher's location opened March 10, 2014 at our Culver/Ridge location at 2055 E. Ridge Rd operated by Ray LoRe. Our second Arthur Treacher's opened on April 7, 2014 in the Village of Webster at our 195 North Ave. location, owned and operated by Silvio Fantauzzo. This location has also added a selection of beer & wine to their dine-in menu! These first two locations proved to be so successful, that we opened two additional locations in May, 2014. A third Arthur Treacher's opened on May 5, 2014 at our Avon location owned by Mike Perrotta, and East Rochester opened on May 19, 2014 at Carl Horsford's 240 W. Commercial St. location. A fifth Arthur Treacher's opened at our Village of Spencerport location at 47 Slayton Ave. on July 21, 2014 and is owned & operated by Vinny Valerie. Sam Alsafadi and his family bring Arthur Treacher's to the West Side of town at our W. Ridge/Mall location for the sixth location. It's Fishalicius! "We are excited about our Arthur Treacher's locations," said SoccerSam Fantauzzo, CEO/Founder of Salvatore's Pizza. "Arthur Treacher's has been a great addition to the Salvatore's brand." The Salvatore's Pizza Family plans to co-brand additional Arthur Treacher's locations and several stand-alone locations throughout the Monroe County area. Salvatore's Pizzeria, Donuts Delite and Arthur Treacher's World Cup commercials aired during halftime of every FIFA World Cup 2014 match during the tournament. Donuts Delite: WHEC TV Rochester ROCS "Best Donut in Rochester!" In July 2014, Donuts Delite won the Rochester Rocs contest in the category "Best Donut Shop in Rochester" from WHEC News10NBC. Donuts Delite came in first place with 39% of the Facebook votes and earned a visit from the station's morning news anchor Nikki Rudd to congratulate owner Nick Semeraro. Our 30th location in Chili opened in September, 2014 and is located at 4165 Buffalo Rd at Westside Drive. This location is owned and operated by Ramez Alsafadi. This location includes our famous full menu delivery, giant TVs, dining room, outdoor patio and beer & wine featuring $1 Gennys! Arthur Treacher's opens at Greece/Mall location! Sam Alsafadi and his family bring Arthur Treachers to the West Side of town. It's Fishalicius! Salvatore's Saloon opened its doors on April 20, 2015. The Scottsville Saloon location offers our Famous Full Menu seven days a week, with a large dining room offering table service, giant TV's, full bar and a separate party room. "The Saloon" theme is a first for the Salvatore's Pizza Family, and features nearly 50 beer varieties including many local choices. Salvatore's Saloon is owned and operated by Nick Pearl who has been with the Salvatore's Family since 1998. He also operates the Salvatore's locations in East & West Henrietta. Nick renovated the former grocery story in historic Scottsville Village with months of extensive work that brought the building back to its original architecture. This location was the first in our company to become a Craft Brewery. After test marketing a new vending machine concept at the Doug Miller Family Sports Park, "Salvatore's Pizza NOW!" vending machines began appearing around the Rochester area. Our famous recipes were used in this amazing product, cooked on the spot and ready in minutes thanks to the technology developed by Pizzametry based in Webster, NY. Salvatore's Pizza Now! machines were placed at several area colleges & hospitals and quickly became very popular. Fire code laws didn't help the growth of this concept. In August, 2015 the Salvatore's Pizza Family reopened the 1872 Café at 431 W. Main St. in downtown Rochester. The cafe is in the historic Susan B. Anthony neighborhood. "This is another Rochester jewel that is so important to our city," said Salvatore "SoccerSam" Fantauzzo. The 1872 Café will remain the same and we will offer donuts from Donuts Delite, and a new pizza concept, “Speedy Slice." In October, 2015, business owners Steve Stokes and long time company manager Louie Fernandez took over ownership of Brockport location. Brockport now offers subs and FREE DELIVERY with valid SUNY Brockport student or staff id! Salvatore's rated #55 pizzeria nationwide! In their annual list of the top 100 pizza companies in America published in November 2015, trade magazine "Pizza Today" ranked Salvatore's at #55 of the estimated 150,000 pizza place in the country! Click here to read the article and see the list! In December 2015, just in time for holiday gift giving, our landmark brands Salvatore's and Donuts Delite appear on the localized board game RocOpoly! Jon Gehrke, a long time company executive took over ownership of the Avon location in January 2016 and will soon be adding a full bar. Speedy Slice Grand Opening on Webster Avenue! The new Salvatore's Pizza Family brand opened its doors at 256 Webster Ave. on February 24, 2016 with a ribbon-cutting ceremony featuring City of Rochester Mayor Lovely A. Warren. The new Speedy Slice concept provides quality, fast and fresh pizza in neighborhoods throughout Monroe County that may have limited food options. Speedy Slice offers pizza slices and hot whole pizzas in less than 5 minutes! The limited menu and no delivery helps to offer affordable family pricing. George Moses, Executive Director of North East Area Development, Inc. (NEAD) will be the Operator of this flagship location. Salvatore "SoccerSam" Fantauzzo was honored on Sunday March 20th at the Brain Waves Event benefiting the Hickok Center for Brain Injury. SoccerSam was the 2016 recipient of their Community Hero award for his courageous struggle back from a brain injury caused by a medical complications in 2009. The mission of the Hickok Center is to provide a safe, supportive environment that encourages people with brain injuries and other neurological challenges to design and direct their own life. After 20 years of service, Patty Powers retired from the Salvatore's Pizza family. Darcey Garbin with JD Media will now be handling media buys for the Salvatore's Pizza family. Patty's departure from our company ignited the idea of a Salvatore's Hall of Fame for 2017. July 5, 2016: On our 38th Anniversary, Mary Chao of Rochester's Democrat & Chronicle published a story about our expanding locations to fit our new Pizzeria & Pub concept. Click here to read the entire article from Mary Chao. We are presently in the process of converting new Pittsford Village, Macedon and Walworth locations to fit our pub concept. In January 2017, Spencerport ownership changed. Louie Fernandez and Steve Stokes, who also own the Brockport location, are now the owners of the Spencerport Village Salvatore’s. January 28, 2017: Tragedy in the Salvatore’s Pizza Family, cousin, Giacomo LoRe passed away. Giacomo was part of our original renovation team from day 1. Giacomo is responsible for our new look at most of our locations and spent the last few years helping renovate the Garage Door and the East Ridge Rd Salvatore’s locations that are owned by his son, Ray LoRe. Giacomo and his wife Venera were the original team to help us grow our brand in 1978. February 14, 2017: The Salvatore’s Pizza Family introduced Cotton Candy Wing Sauce. This new sauce is bright pink, all natural and is an amazing wing sauce and dipping sauce. Our 4000 Lake Avenue location was totally renovated inside and out in 2017. This location opened in 1982 and was the original new look of our growth back in the 1980s. Now, this location resembles our newer 2017 locations. Ashley Maria King and her staff went to the 2017 National Pizza Show in Las Vegas, Nevada. Several new concepts and products are in the works. The Salvatore's Pizza family introduced a new marketing food truck this year. The vehicle will be used for special events and to market our brands throughout Monroe County. In May 2017, the Salvatore's Pizza family is proud to announce the return of the Rochester Lancers soccer team. The team started in 1967 and will be celebrating its 50th anniversary season. The Lancers will play at Aquinas, the home of the original Lancers. The Lancers NPSL mens team will be coached by Rocheter soccer legend Doug Miller. Marc Mandell is the GM. Ashley King is the president of soccer operations. The Lancers also introduced a womens team to play UWS league and they will be called The Lady Lancers. Loren Ingllese and Sal Galvano will coach the womens team. Salvatore's Pizza family is proud to be the title sponsor. Salvatore's at the historic Donuts Delite building celebrated National Donuts Day for the 9th consecutive year. Our Mayor Lovely Warren, Country Executive Cheryl Dinolfo & Majors Doug & Judy Heart joined VP Ashley Maria King & Nick Semeraro owner on this historic day handing out free Cannoli Delite Donuts. On June 5, 2017 the Salvatore's Pizza location at the Clover Lanes Plaza in Brighton closed after 30 years of business. The Whole Foods project had been delayed and the landlord decided to close this property. Owner Greg Dillingham was unable to relocate in Brighton in 2017 and purchased the South Wedge location from Mike DelGaizo to service the Brighton area also. The Salvatore's Pizza family purchased a property at 1661 Empire Blvd. in late 2016. We converted this property to a four-story office complex for the future growth of our brands. 1978 original employees Dave Gross & Charles Arbore helped with the renovation. The ribbon-cutting was scheduled for early 2017, with town delays the new location should open by January 2, 2018. We will have a test Speedy Slice location on the premises, complete training center and our new Salvatore's Pizza Hall of Fame and Rochester Soccer Hall of Fame. The Walworth location re-opened on November 6, 2017 at 3719 Walworth Palmyra Rd Walworth, NY 14568. This location was totally renovated with a new bar to meet the company's 2017 standards. Frank Freida is the operating owner. Frank started with the Salvatore's Pizza family in 2009 at our Lake Ave location. He then worked at our Main St location at the age of 23 he is the new owner of our Walworth location. On Saturday, November 11, 2017 Salvatore's introduced their new Veterans Day free pizza promotion. Each and every Veterans Day, Veterans & active military can receive a free medium 1 topping pizza, It's our way to say thank you! Salvatore's added a new charity for the 2017-18. The company will now support the Just Breathe Foundation as a gold sponsor. The Cystic Fibrosis Christmas Ball was on Saturday December 16, 2017. Company executives Ashley Maria King, Salvatore "SoccerSam" Fantauzzo & Linda Fantauzzo represented for the company. Rich Randall former VP of the Rochester Lancers represented our brand. Sam Pizzo is now handling our website and Internet Marketing. Sam worked with longtime webmaster Michael Moran to update the Salvatore's website to the latest web technology. Sam has been instrumental in helping many company's upgrade their websites and add more online exposure from Google. Sam is determined to help the Salvatore's Pizza family grow in 2018 and beyond in many areas. June 1, 2018: National Donut Day Salvatore's at the historic Donuts Delite building celebrated National Donut Day with the Salvation Army. Monroe County Executive Cheryl Dinolfo & Majors Doug & Judy Hart from the Salvation Army joined Salvatore's VP Ashley Maria King & Donuts Delite Owner Nick Semeraro handing out FREE Cannoli Delite Donuts all day long! July, 1 2018: Salvatore's VP of Operations, Ashley Maria King, got married! Salvatore's CEO & Founder, Salvatore SoccerSam Fantauzzo said a reading at the wedding. Ashley's new Husband, Marek, is a Medical Student and lives in Erie, PA. For 3 years, Ashley has commuted 3 hours to and from Erie, PA & Rochester, NY for her job at Salvatore's. Donuts Delite was the main dessert at the wedding reception. A wall full of Donuts Delite... YUM! July, 5 2018: Salvatore's celebrated 40 years of business in Rochester! In celebration of our 40th anniversary, Salvatore's donated $40,000 to Camp Good Days and Special Times, and announced that they have raised more than $40,000 for the Breast Cancer Coalition of Rochester. July 5, 2018: Salvatore's Pizza Celebrates 40 Years with 2 Major Donations! Handmade Gift from Customer, Tasha Mercado! Aug 4, 2018 Salvatore's sponsors Austin Giorgio, star of The Voice, first concert at Geva Theatre. The concert sold out! October, 2018: Salvatore's continues their Pink Pizza Box Campaign, for October's National Breast Cancer Awareness Month, and National Pizza Month. Salvatore's will have Pink Pizza boxes in all locations for an entire year, in hopes of donating $41,000 to the Breast Cancer Coalition of Rochester by the end of 2019. Oct 3, 2018: Chazz Palminteri, Star of A Bronx Tale, visits the original Salvatore's Pizzeria Location on E Main St! Chazz taste tested all of our famous specialty pizzas. Salvatore's introduces "The Calogero", a Specialty Pizza named after Chazz! Logo donuts and custom cake was provided by Nick Semeraro, Owner of Salvatore's at Donuts Delite. Salvatore's Pizza was announced as the "Official Food" on stage in the Rochester performances of A Bronx Tale the Musical at RBTL. Oct 4, 2018 Taste of Rochester Opens. Salvatore's Outlet opens in the Greater Rochester International Airport inside of the Taste of Rochester booth! Customers can now get Salvatore's famous pizza in the airport, before or after their trips! Salvatore's celebrates delivery drivers that have been with Salvatore's for 5+ years! 3 Generations of Pizza! Salvatore SoccerSam Fantauzzo's grandson, Santino, starts working at the Webster Village Salvatore's location. From Baby TV model, to Pizza Maker! November 11, 2018: The Salvatore's Pizza Family honored all Veterans with a FREE Medium 1 Topping Pizza on Veteran's Day. Nick Pearl, Owner/Operator of 3 Salvatore’s locations: Scottsville Rd, E Henrietta, and Scottsville Saloon. Nick Pearl is a Veteran of the US Marine Corps. Nick landed in Kuwait on February, 15 2003. He was part of the Task Force Tarawa (TFT), the 2nd Marine Expeditionary Brigade during the 2003 invasion of Iraq. The TFT is most known for their participation in the city of An Nasiriyah; Nick drove a Wrecker. Each year on Veterans Day, Nick sets up a POW/MIA tribute table at his Scottsville Saloon location. Under Nick's suggestion, all Salvatore's Full Menu locations no offer free pizza to Veterans and Active Military on Veterans Day. Read more about it in the Rochester Democrat & Chronicle Digital Edition. January 2019 - Salvatore's Pizza Supports Local Teams & Local Brews! All Salvatore's Pizza Pubs introduced new Lancers Lager by 3H Brewery. The Lager was made especially for the Rochester Lancers Indoor & Outdoor Soccer Teams. We LOVE LOCAL SUPPORTING LOCAL! January 17, 2019 - Salvatore’s Old Fashioned Pizzeria was ranked #80 in Pizza Today’s list of the Top 100 Pizza companies in America! Full Release: Salvatore's Ranks In The Top 100! February 14, 2019 - Another year of Heart-Shaped Pizzas! Salvatore's Pizza continues the tradition of selling Heart Shaped SuperSlice's on Valentine's Day. Give A Slice Of Your Heart! March 17, 2019 - Salvatore SoccerSam Fantauzzo is named "Business Leader of the Year" by the Rochester St Patrick's Day Parade! Congrats SoccerSam! April 4, 2019 - Salvatore SoccerSam Fantauzzo, Kayla Klark Kent-Moreira & Ashley Maria King meet with the Breast Cancer Coalition of Rochester to discuss the Pink Pizza Box Partnership, and learn about the Coalition's many programs and events to help the community. Salvatore's is proud to donate to this amazing organization that keeps all moneys raised, right here in Rochester, NY! Salvatore's pledged $40,000 donation to the Breast Cancer Coalition of Rochester in honor of our 40th anniversary, and has goals to donate $41,000 next year! 2019 NEW LOCATIONS COMING SOON! - A new location on Monroe Avenue in Brighton/Pittsford, and in Macedon, are set to open soon! The Salvatore's Pizza family is excited to pay tribute to all the loyal employees and support staff that have helped our company grow since 1978. Founder Salvatore "SoccerSam" Fantauzzo felt it was important to remember the great people that have been apart of the company since day 1 to today. Each year we will add new members to the Hall of Fame. If you are a former key employee that worked 10 or more years, manager or contributor please email soccersam@soccersam.com We are also looking for pictures from locations and employees, please email them with date and description, thank you! Inducted Franchisees: John Coraggioso, Charles Fantauzzo, Ray LoRe, Jack Grover, Chuck LaRocca, Irv Pudetti, Hassan Alsafadi, Mike DelGaizo, Lisa DelGaizo, Vinnie Valerie, Tonino Mangione, Chris & Clay Pearl, Roxanna Fantauzzo, Salvatore Fantauzzo II, Silvio Fantauzzo, Nick Pearl, Marco Palazzo, Carl Horsford, David Sykut, Dave Laspina, Dennis Glavas, Greg Dillingham, Jay Harrison, Mike Perrotta, Jon Gehrke, Craig Houghton, Sam Alsafadi, Nick Semeraro, Raimondo LoRe (Lil Ray), Chris & Toni Avery, Massimo & Sofia LoGuidice, Steve Stokes, Louis Fernandez, Ramez Alsafadi, George Moses, Frank Freida. Class of 1978-1980: Teacher Adele Mitchell, Attorney Joe Guadagnino, Vince Cilino, Nino Cilino, Linda Calabrese, Grandma Carmela Oliveri, Aunt Mary Arbore, Mom Eva Fantauzzo, Aunt Mary Sampognaro, Aunt Anna Oliveri, Aunt Josephine DeLuca, Uncle Sam Arbore, Dad Silvestro Fantauzzo, Cousins Giacomo & Venera LoRe, Sister Valerie Fantauzzo, Lisa Arbore, Diana Calabrese, Gary DiGabriel, Enzo Vella, Phil Coroggioso, Dave Gross, Joe DeGeorge, Sebastian Curatalo, Tony Gabrielle, Chuck Formoso, Luciano Arigo, Al Grimaldo, Carm Puglia. Class of 1998-2007: Michael Moran, Patty Powers, John Catalano, Enza Sanfilippo.